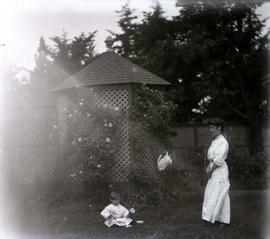 Photograph depicts an unidentified woman and baby, members of the Sylvester family. 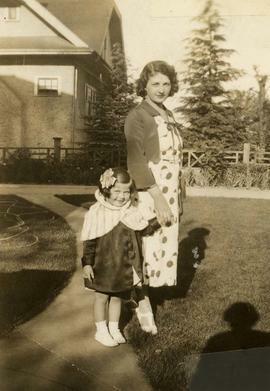 Photograph depicts an unidentified woman and child posing in what appears to be a yard of a house with a house in the background. There is a shadow of a person in the lower right corner of the image. B&W print depicts an unknown man and two children standing in front of tents in the snow. B&W print depicts an unknown man and an unknown woman standing on either side of two unknown young children. They are standing in front of what appears to be a house.Note: colour adjusted on jpg. B&W print depicts unknown women dressed in flapper style clothing and two children standing on what appears to be a pier. There is a building behind them.Note: colour adjusted on jpg.